Earlier this week Jaxson received a VERY special package in the mail….. In this box is a blanket filled with love. Literally, it is filled with love…. Let me explain. There is an angel out there who makes blankets filled with love for sick children and children with disabilities. Of course it’s only fitting that her name is actually Angel (serious)! Angel had a vision to wrap sick kids up in warm hugs. Of course there was no way Angel could visit every sick kid in person (which I know she would LOVE to do!) and give them a warm hug, so she decided the best way to spread her love and warmth was to make them blankets. She then took her vision to another level, and with the help of her mom she started her own non-profit organization called Hugginz By Angel. 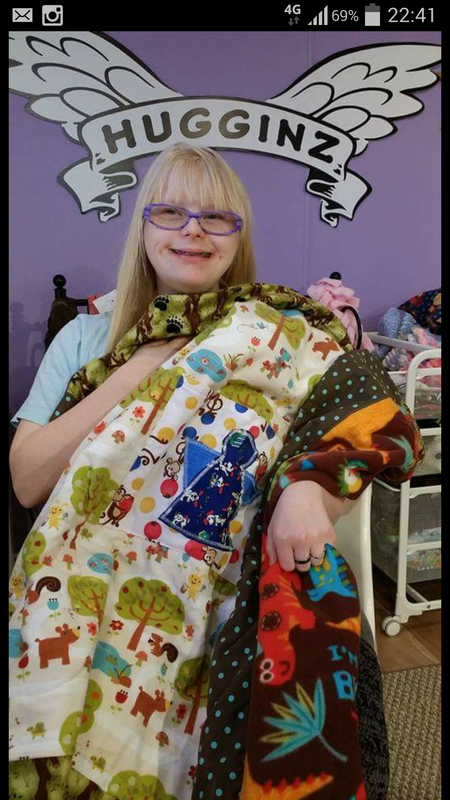 Each blanket is made with a specific child in mind. First, she carefully selects what fabric she would like to use in the blanket. She chooses a fabric that pertains to that child’s interests and likes. Angel then sews the blanket, and as a finishing touch she sews on an angel. Once the blanket is finished, Angel literally fills the blanket with love! She sits with the blanket with her arms tightly wrapped around it in a giant hug, she prays for the child it is going to, and puts all of her love directly into the blanket. 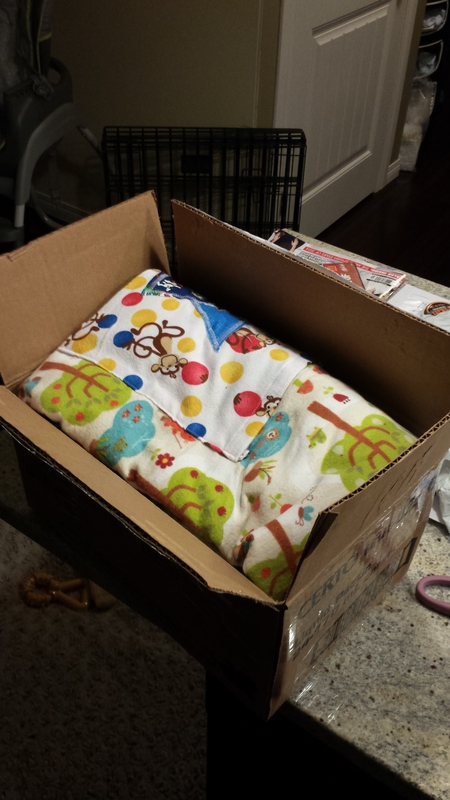 Angels mom then packages up the blanket and ships them off to the child. Angel’s list of children waiting for a blanket is LONG, and she sews for endless hours a day. If that isn’t enough, Angel also knits and paints! Not too sure how she finds enough time in the day to do all of this. On top of her busy work schedule Angel fights her very own health issues, she is one tough cookie. 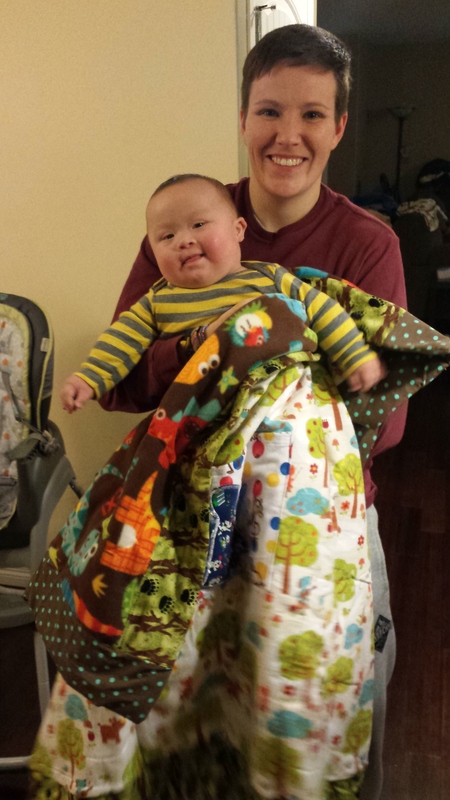 As if this blanket isn’t special enough already I should mention here that like Jaxson, Angel has Down Syndrome…. Angel chose this fabric because Jaxson has an owl/forrest themed room. Also, I don’t think she knew this but Jax’s momma LOVES dinosaurs, which is what is on the other side of the blanket! I’m thinking his momma will win the battle of the “child room decorating theme” now, because she has been saying his room will be dinosaur for quite some time. I could go on forever and ever about Angel and the amazing work she does. Please follow them on FB under “Hugginz by Angel”. To make a monetary or fabric donation visit her website http://www.hugginzbyangel.com. If you know of a sick child or child with a disability in need of an Angel hug you can let that child’s parents know and they can visit her website to refer their kid. Also, check out this awesome video Telus made about Huggniz by Angel.